June 25, 2003 You’d have thought something big was getting ready to happen by all the activity and excitement this week. Monday, of course, is the Big Day, as the approximately three-day launch process starts. 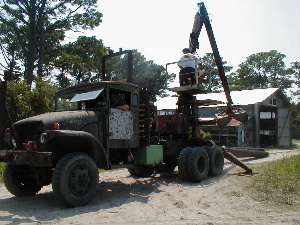 Julian Brown is like Mad Max on steroids with his exotic vehicles preparing for the launch trajectory. 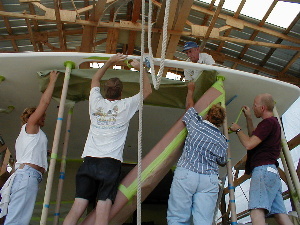 Timbers will be placed on the ground, and the Huckins will be slowly pushed out on log rollers. 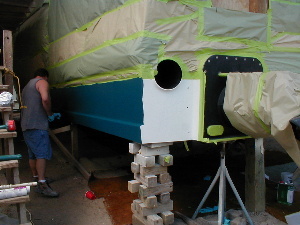 Meanwhile, Cherokee’s bottom has been painted a pretty blue, and the stainless steel rub rail is getting attached to the wooden bumpers of the boat. 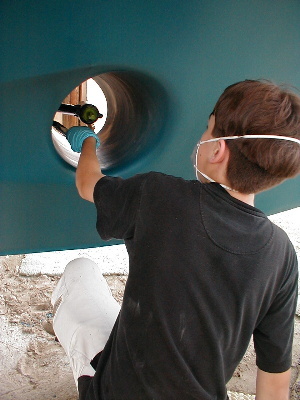 Smaller hands were called for to take care of the finer details. 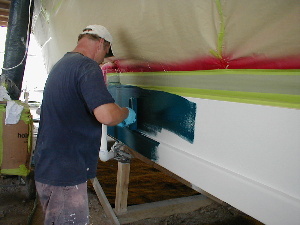 Below Aren paints around the bow thrusters. 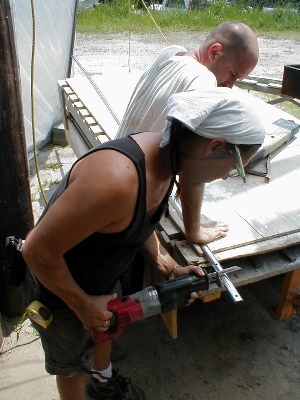 Bryan and Chris began installing the stainless steel rub rail, cutting the sections and bending the corner piece. 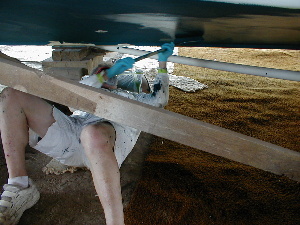 The pieces had to be formed to fit the corners of the rub strake shown below. 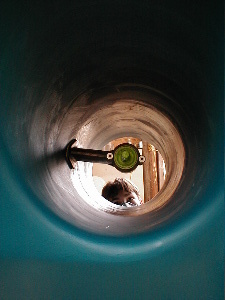 Shown here is Bryan cutting the first full-length piece of bumper metal. Meanwhile, that rowdy bunch of painters from the Ernul area (where’s that??) 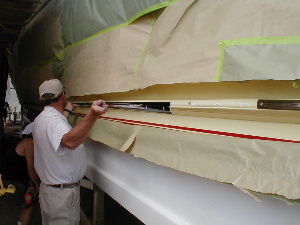 wrapped all stainless steel and pretty varnish pieces so they could spray yet another coat of paint to the flybridge. Once again this task was assisted by a fire chief and a red truck, as water was applied all around to minimize the dust that the Road Warrior operation kicked up!